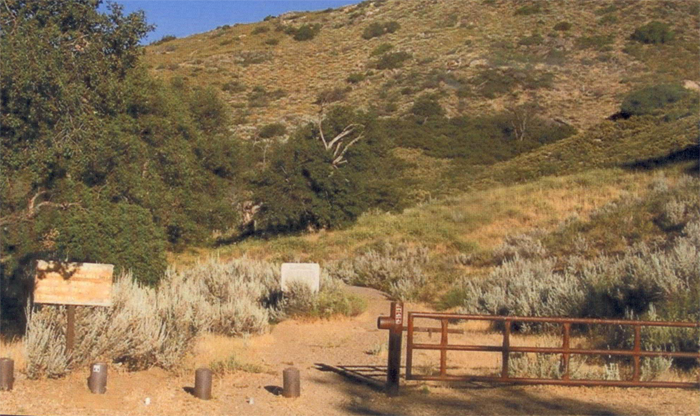 Length of Trail: The easy part of this trail is relatively short, about 3-4 miles. 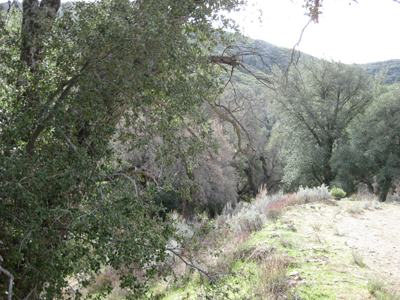 However, it includes magnificent views, varied terrain and a beautiful stream, Pine Valley Creek. It can be extended another 20 miles to include the Secret Canyon Trail, see below. Staging Area: The staging area is at the Pine Creek Trailhead which is located at mile 3.5 on Old Highway 80 just west of Pine Valley. There is a narrow, sometimes single track road down into the valley. There are no specific parking spots for trucks and trailers, but there is plenty of room to park. There are places to tie your horse, restroom facilities and a place to picnic. Water: There are some seasonal streams on the trail. Trail Conditions: Easy. There are some hills, closed gates to open. There may be cows grazing in the valley. 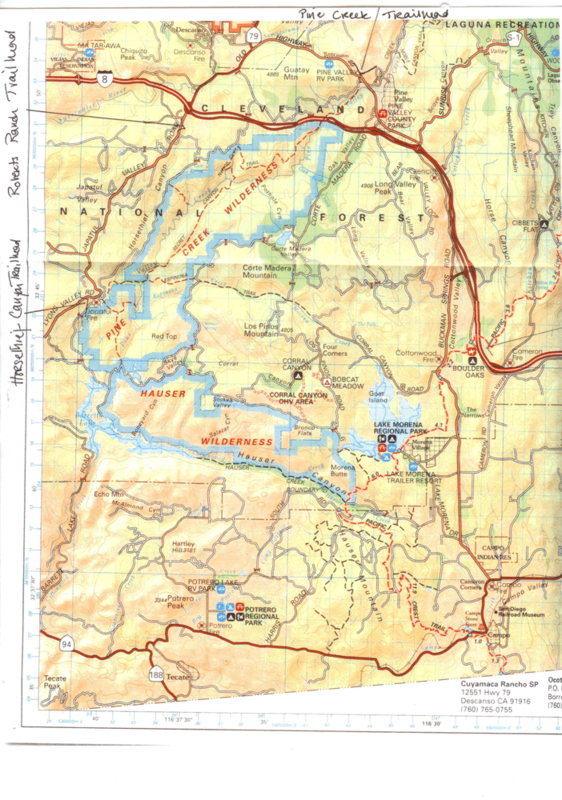 Trail Use: You need a National Forest Adventure Pass to use this area. 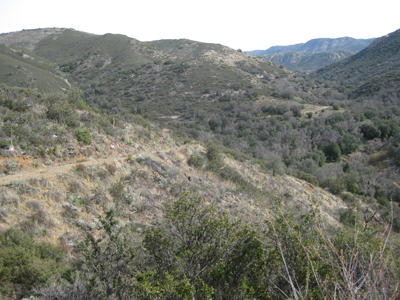 Click here for the US Forest website, or call the Cleveland National Forest Descanso Ranger District (619) 445-6253. The passes can be purchased at stores in Descanso and Pine Valley. General Trail Info: You can take the fire road up the side of the hill for 1.6 miles until you are stopped by a locked gate. It is still worth doing as the views are amazing and the footing is good with few ruts and rocks. There are two trails to the left where you can leave the fire road and go down into the valley by the Pine Creek. The second trail is wider and less steep than the first one. There are a few cows grazing in the area and be sure to shut all gates. The alternative route is to take the Secret Canyon trail. 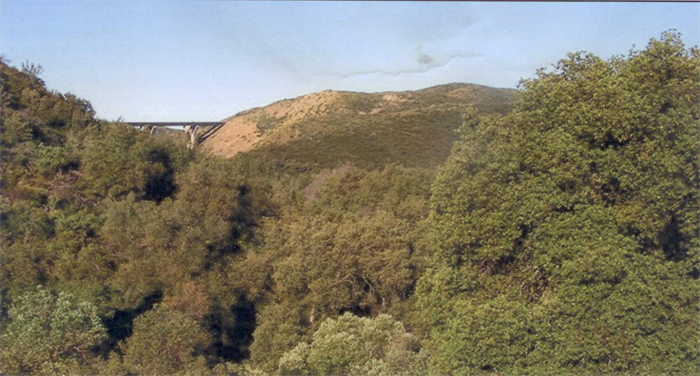 This follows the Pine Valley Creek and after two miles you pass under the Pine Valley Bridge of Highway 8. The trail continues for another 11 miles or so and ends in Horsethief Canyon. However, there are steep narrow parts to the trail and I don’t recommend it on horseback. 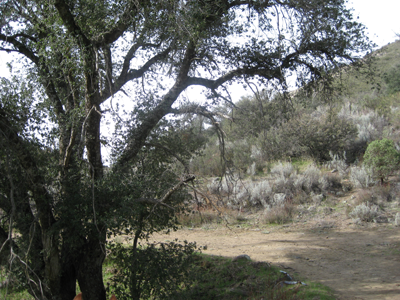 For a more detailed description of the Secret Canyon Trail to Horsethief Canyon, see Jerry Shad’s book, Afoot and Afield in San Diego County.